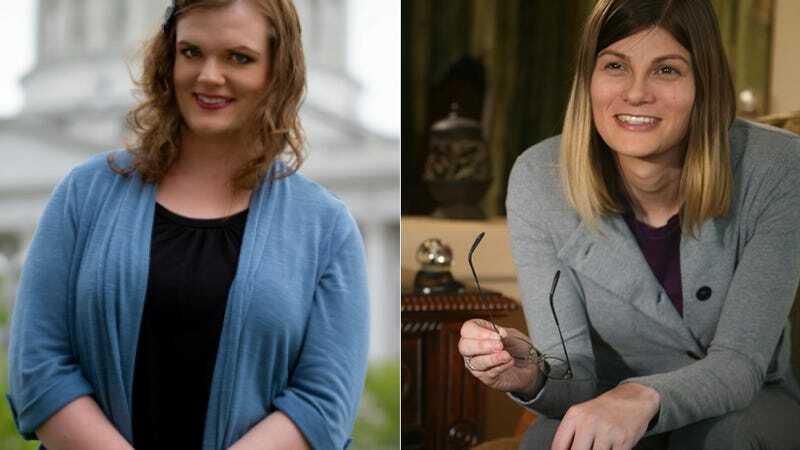 For the first time, two trans women will be running for Congress under the auspices of a major political party. Utah’s Misty K. Snow and Colorado’s Misty Plowright—both Democrats, both trans women—have handily won their primaries, and will face Republican opponents this November, per Politico. In Utah, Snow, 30, will challenge incumbent Tea Party Republican Senator Mike Lee, having beat out her Democratic primary opponent Jonathan Swinton at 59.5 percent to his 40 percent. The first trans woman to ever run for Congress, she entered the race at the last minute and edged out Swinton “largely by criticizing Swinton for advocating for limits to abortion rights,” reports the Salt Lake Tribune. She also ran a generally more progressive Democratic platform as opposed to Swinton’s conservative one, advocating for paid family leave, free or reduced college tuition, a higher minimum wage and the legalization of weed. Snow’s platform is inspired by her own experience: she’s worked for the past 13 years as a cashier at a Harmons grocery store, which also employs her mother. She has never been to college owing to costs, but in May told the SLT she wanted to make a change in the race after reading an op-ed Swinton wrote advocating for Congressional investigation of Planned Parenthood. With zero experience but strong convictions—she called Snow “the second most loathsome guy in the United States Senate behind Ted Cruz”—she gradually won over voters, all while still clocking in at the grocery store. In Colorado, Misty Plowright won the Dem primary for House Representative in the conservative 5th district, and will now face incumbent Rep. Doug Lamborn. Plowright, 33, is a self-described “IT nerd” and “policy wonk” who also ran on a more progressive platform, emphasizing income inequality, education and police reform, the reinstatement of voting rights, climate change and foreign diplomacy. She also advocates for expanding and modernizing broadband access and thereby creating jobs in the tech sector. Plowright, 33, also comes from a working class background, raised in Arkansas by her grandmother and single mother. Like Snow, Plowright could not afford to attend college, instead joining the US Army and working in IT before an honorable discharge in 2003. According to her bio, her lack of higher education was an obstacle to work, but she had some unnamed lucky exchange that enabled her to get into professional IT; during her campaign, she too worked and will work in order to support her family, which she says includes her wife, Lisa, and their longterm mutual partner, Sebastian.